Soon after or during high school (It was so long ago, who can remember?) 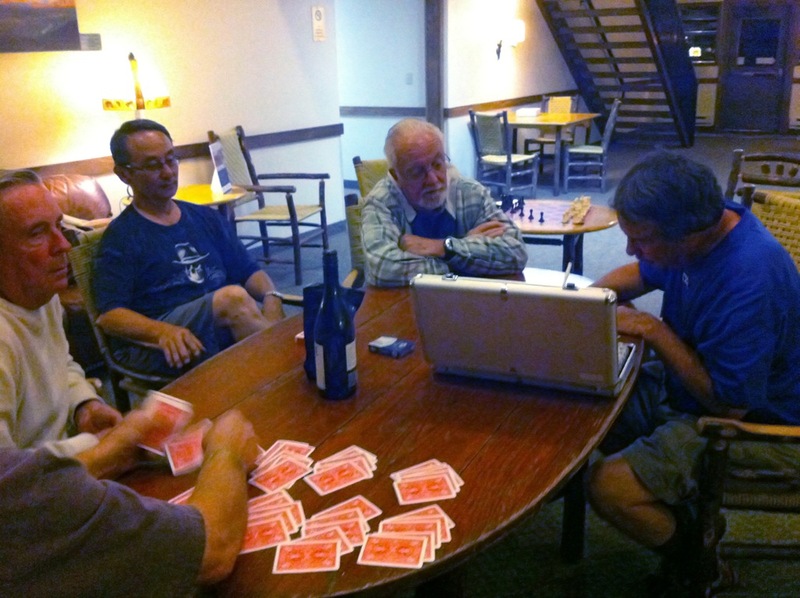 a group of our Class of 1963 classmates began getting together regularly to play poker. Over the years, as the members moved away from the South Bay, it became harder and harder to get a quorum together. They did meet at Harry Nieves’ home in 2004. Click here to see some photos from that gathering. Earlier this year, Steve Mortenson and Joe Reeve suggested the group get together, and in addition to playing a few hands of poker, do some hiking. Here are a couple excerpts from the several emails Steve sent to the group to gain support. Gerald suggested that we should stay on theme and end with a poker game, and perhaps at a neutral site that would be appropriate, like Las Vegas. Having seen “The Hangover” last year, I’m unconvinced, but just as a sidebar, it could fit with either Joe’s or my proposal. 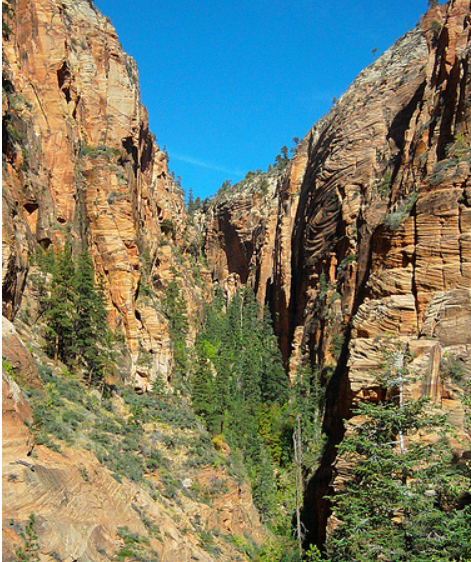 Steve went on to propose a series of three 15-mile hikes over a span of four full days in Zion National Park. Generally speaking the response was quite positive from the group, EXCEPT for the three proposed Death Marches. The general consensus was they might be a bit too much – ok totally insane. Collectively, the group was past their prime, were out of shape, and body parts had already been replaced or about to wear out. Other activities were suggested, certainly poker, horseback riding and basically enjoying the scenery and camaraderie while hoisting a few beers. As it turns out, the drink of choice was wine not beer, which was generally consumed over dinner. The 2011 Edition of the Poker Group is pictured in the photoshoped picture below. The original picture included most of us who completed Death March 4. Unfortunately, Gary was not able to join us. He had to head home a day before the rest of us. 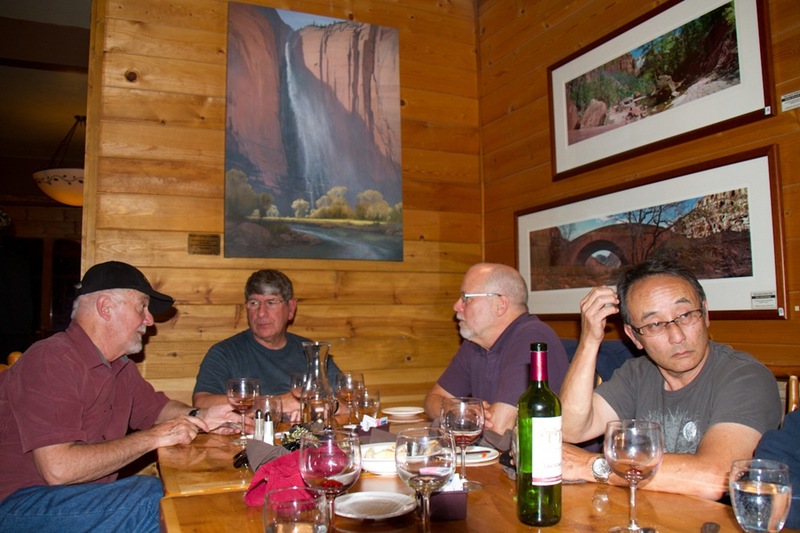 On Thursday and Friday, prior to Joe and Don arriving, various members took a variety of hikes – from Weeping rock up into Echo Canyon; the Gateway to the Narrows walk; Emerald Pools and the Kayenta trail; and Canyon Overlook. 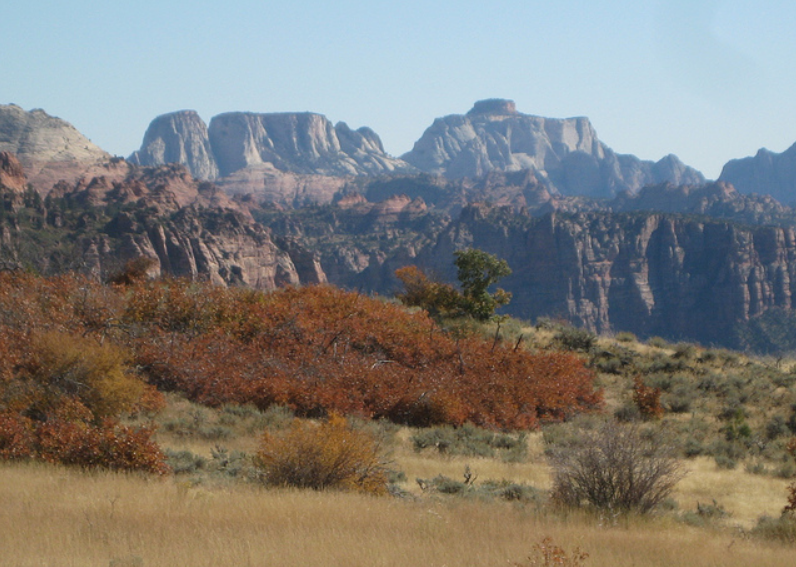 The group also took a drive out on Zion Terraces Road to Lava Point. 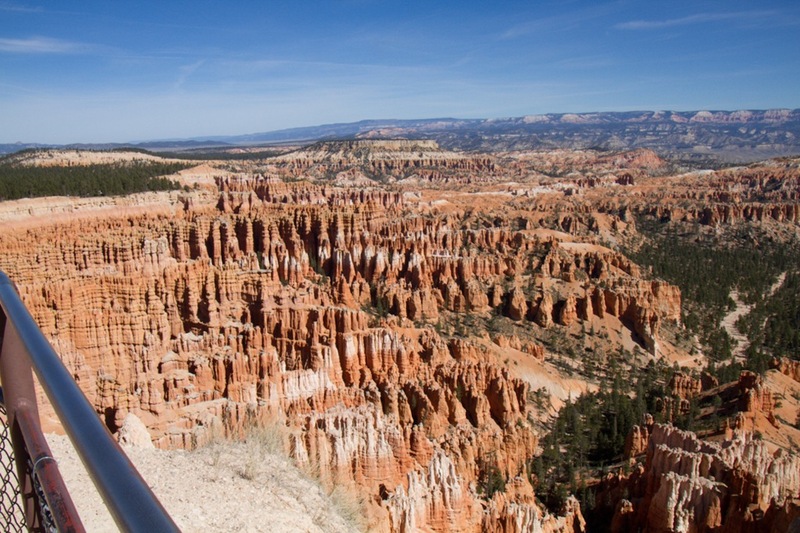 Saturday, most of the group drove to Bryce Canyon for a stroll along the various vista points. No death marches for us. Royal chose to take one of the more popular moderate hikes to Scout Lookout. 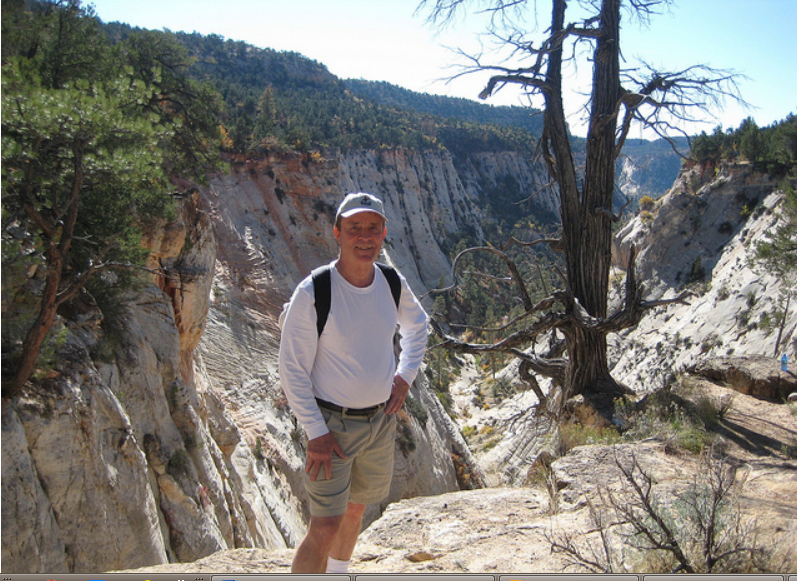 And Steve, well he conquered Death March 2 starting from a different trailhead. Because of that and a slight detour along the way, fifteen miles turned into a 19-mile trek. He returned to the lodge about 8 pm, just as we were finishing dinner. We had begun to worry just a little, since we dropped him off at the trailhead before noon. 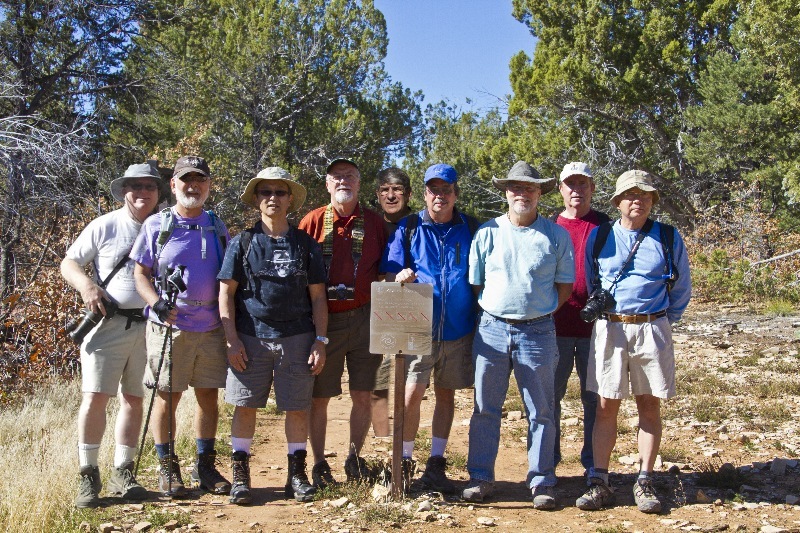 On our final full day in Zion, the group succumbed to Steve’s suggestion for a fourth death march hike, one that he thought would be a challenge for the group but would not cause any deaths. He pointed out the very modest change in elevation. But what he did not stress, was that was a net value. There were a lot of ups and downs along its 6.5-mile round trip. However, the view of the valley was spectacular, and we all made it without any real problems. Oh ya, this poker group finally ended up playing cards for a couple of hours Sunday night. However, most of the time was spent figuring out how to distribute the chips. Monday we all headed for home, but not before some gathering ideas for the next poker event and assigning Steve to again act as our tour director. It appears that Yellowstone will be the next meeting place for the group. Most of us took lots of pictures, far too many to include here. Instead we posted our photos on Flickr. Click on the links below to get flavor of the beautiful country and the great time we had. It’s a pleasure for me to say that I was in the same CLASS as you guys. Glad to hear from you! I haven’t seen you since Joe Reeve’s shore line death march. My older son decided to live in Spain (Vitoria-Gasteiz) for a while earlier this year and so the rest of the family (my wife, younger son and me) went to Spain to spend Christmas/New Year with him. We did some sightseeing in Bilbao, Vitoria, Madrid, Toledo, Cordoba, Sevilla, Granada, Valencia and Barcelona (loved Sagrada Familia!). Spain is a wonderful country and I thought of you when we were traveling there.